Some good news this week as more Carillion workers were told their jobs are safe. After the crash of the construction and services firm, the Insolvency Service said that 4,400 staff who worked in prison maintenance and services for military bases (catering, cleaning, etc) would transfer to other firms who will carry out the work. We don’t know which firms or what the process was for transferring the work though – it would be interesting to know how that was done under the procurement regulations. Huawei, the Chinese networking equipment and smartphone manufacturer, has made a £3 billion procurement commitment to the UK in a bid to expand its presence in the country. Huawei chairwoman Sun Yafang met with British prime minister Theresa May the other day to sign a pledge to plough billions into the British economy. The firm employs 1500 staff in the UK and we assume this pledge is about buying from UK suppliers? What is interesting is that once upon a time there was real concern that Huawei might be tied in to Chinese high-tech spying – but then the CIO for the UK government, John Suffolk, went off and joined them, so everything must have been OK, mustn’t it? We’ve featured a couple of interesting procurement jobs here recently, and we saw another one just yesterday. We should say immediately that with a salary of just £18,500, it is not going to set too many hearts racing with excitement. 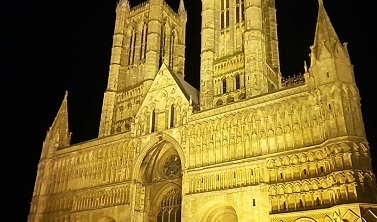 But, as the IT and Procurement Officer for Lincoln Cathedral, you may of course receive non-financial (and non-worldly) rewards that are truly out of this world. And you will be working for what is quite possibly the most beautiful cathedral in the world (I'm quite proud of my photo here). One assumes that with a salary at that level, it might appeal to someone semi-retired (or who for other reasons doesn’t really need the money) with a real religious commitment? Mind you, property is really cheap in Lincoln.